I have been searching for quite sometime for a smaller desk for my bedroom. I was beginning to think I was not going to find what I was looking for at a price that was affordable. I was just about to put that project on the back burner for a while, and then by chance one day my husband and I went to explore a new antique mall that had just opened a few weeks earlier and I spotted the perfect desk ( I am sure it was a vanity at one time) but it was the right size and style that I wanted, but the catch was it was from an estate sale and it was not going to be offered for sale until the next week, I went home thinking to myself I was probably not going to be able to get it as I am sure the price would be unaffordable and my chances of being there at just the right time was a slim chance. I went home feeling a little sad that I had found what I was looking for but with little hope of getting it. My husband said to me we will be there first thing when the estate sale opens on that Friday so I was starting to feel a little more positive, As the next few days went by, I was looking forward to the sale. Then we had an unexpected surprise happen in our lives ,God intervened and we were given a miracle and we had to take care of some very important business that would keep us from attending the estate sale. Saddened as I was, I am a firm believer that everything happens for a reason every thing is part of God’s Master Plan for our lives, I once again said Lord if it is meant for me to have that piece of furniture it would still be there when we returned from our personal business trip out of town on Friday, Sept 5th. On Saturday I got up late then started cleaning the house and was just thinking to myself that I am not going to go by the Estate Sale because I am sure the desk is not still there so I continued on with my housework, I had stop anyway for a break and take my granddaughter, Amber, to work at 12:00. After I dropped her off I grabbed some lunch, and just thought to myself why not run by the estate sale so I could finally put to rest my anxieties about the desk, and to my amazement I spotted out of the corner of my eye that it was still there, suddenly my heart skipped a beat. I quickly went to inquire about the price and if prices were negotiable, and the salesperson said “Honey everything is negotiable I gotta move it”, not only was it still available, it was at a very affordable price so I was able to also purchase the desk, bench, and night stand for what I would have paid for the desk alone had I gone the first day of the sale. God had His hand in the matter all along!!! Isn’t He Wonderful!!!!! Needless to say, I was super anxious to get started refinishing the pieces “Shabby Chic Style”, using the most wonderful paint out there on the market today, of course this is just my opinion, Annie Sloan paint, I used Old White for my base coat and second coat, then I used Pure White for my top coat. I then lightly sanded the pieces all over and then distressed the edges and then used a very watered down application of Fresh Linen as to highlight the corners and into the grooves of the decorative edges, I then allowed it to dry overnight, next day I applied a clear soft wax coat all over the entire pieces and applied a second coat after a few hours, I allowed that to dry and then buffed the entire pieces. I am so happy with the way they turned out. This is the exact same technique I did several months ago to another piece I refinished for my bedroom that I am using as my dresser, I am sure it was once used as a sideboard, amazingly enough the pieces are so similar even the hardware almost identical. Now I am in search of a vintage style lamp for my new bedside end table. I will now be on the lookout for an old wooden file cabinet to house all my files that won’t fit in the desk since it has much smaller drawers and not the traditional file sized drawers. Oh well, that is the trade-off for not purchasing a newer more modern desk, but I wouldn’t trade it!!! I count it a gift from God!!! I also have to do the make over on my sleigh bed, but that will be a huge project , I will have to wait till next summer to tackle this job. This picture was taken at the store where I purchased it. Not an exact match, but same style and the hardware is very similar so I pretty much think it is from the same era in time. Getting Ready for Prom!! So Much Fun and Nerves Galore!!!!!! Dress was passed down from Megan’s cousin Kaitlynn. Kaitlynn also wore this dress for her Senior Prom in Dinnwiddie County Virginia, it was an honor for Megan to have been given her dress to her by Kaitlynn. Megan’s friends Mariyah. and Lexi all went together to senior prom. They started out by taking pictures at the Driftwood Inn then more photos at Riverside Park, they all went to Outback Steakhouse for dinner where the Limo picked all the girls up to take them to prom held at the Indian River county Fairgrounds from there just a fun filled night spent with classmates and friends. Kaitlynn, my oldest granddaughter graduates from dental hygienist school. My daughter Tina, who is a photographer did both announcements. I am so proud of both of you. I have put a link below to follow my daughter’s link on facebook if you would like to see some of her work. I have always been intrigued with all things shabby chic. I love anything vintage especially repurposing old furniture to take on the shabby chic look. Quite a number of years back, I went for the more country, primitive look, but my style has changed the past 15 years or so. As with most of us, life passes by year by year and we never can seem to get around to the things we want to accomplish in life. However, as of late, I am trying to get around to refinishing some of the pieces of furniture that I have had for many years to take on a more shabby chic look. I recently found a piece of furniture at a local thrift store. I so love with the way it turned out, that I can’t wait to move on my next project. Of course, once again life has a way of putting things on hold . I plan to get back on tract as soon as (2) graduation events for my granddaughters take place early in June. Next will be a visit from my daughter Tina and youngest granddaughter Madison early July hopefully after these plans I will be gearing up to start on my long awaited projects. I am in love with the Annie Sloan Chalk Paint products and techniques. I am so fortunate to have a local Stockist in my town, “House of Charm Antiques”, they have been so wonderful in sharing techniques and allowing me to come in and play with the colors and mix various colors to make custom colors for some recent pieces that I have completed for my granddaughter, Megan who lives with us, for her room. She loves the more modern, bright look . It was hard for me to just do a piece very plain. I still have several pieces to paint for her room but once again, time has not permitted me to complete this project . Too many events for her senior year, prom, etc, and planning for her graduation that those projects have also been placed on the “back burner”. My bedroom project is a work in progress, I have several more pieces to redo using the Annie Sloan Chalk paint. I also have to make my new curtains for widows, rip up carpet and put down laminate flooring and paint the walls. So yes, this will be a huge project. All my bedroom furniture is many different styles but will all be painted using same technique. The table beside my bed belonged to my mother. It is a simple table, but because it was my mom’s I can’t bear to part with it and it is small enough to fit in the space that I have. I have already painted it to match my dresser. I love my pink “Paris”knob for the drawer pull. We still have to stencil the wall above her bed, find her drapes (curtains), paint her closet door, also her TV will be hung from wall mount, get new lamps and throw rugs so definitely a work in progress. I am a wife, mother, and a grandmother. I have a son and a daughter. I have five beautiful grandaughters. I am so blessed to have such a wonderful family. With so many treasured memories to document, I am kept busy creating keepsake albums of the wonderful times spent with my family both together and apart. I thank God for the creativity "HE" has bestowed on me to be able to express my love for my family through scrapbooking. 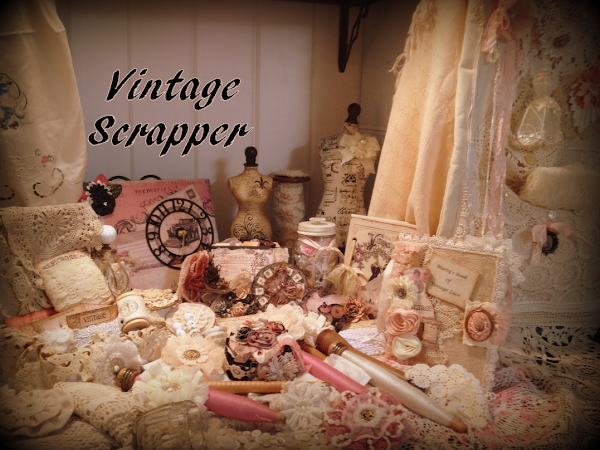 My Daughter, Tina and I share the same love for scrapbooking, I have linked her blog to my site. Please feel free to visit her site as well.